Another BatteryStuff favorite. Built with pride in the USA, these are one of our most well made, durable lines of chargers! 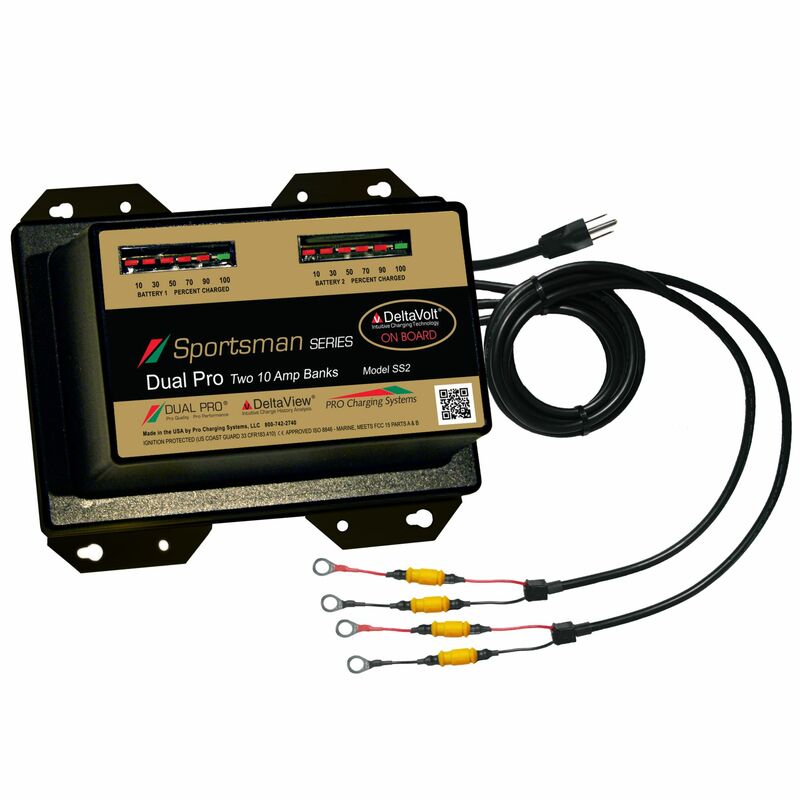 The Dual Pro SS2 Sportsman Series charger will deliver up to 10 amps per bank. The Sportsman Series SS2 charger has microprocessor-controlled independent outputs, offering overnight charging and dependable long-term storage. Dual Pro Battery Chargers incorporate important features such as being fully waterproof, completely automatic, overcharge protected, temperature compensating, and ignition protected. They also have LED readouts, and are USCG approved. Can be utilized for multiple 12 volt battery configurations series and/or parallel 12 or 24 volts; where rugged waterproof charger construction is needed. Each bank outputs 12 volts meant for individual 12v batteries no larger than a group 31 battery (approximately 130 AH). 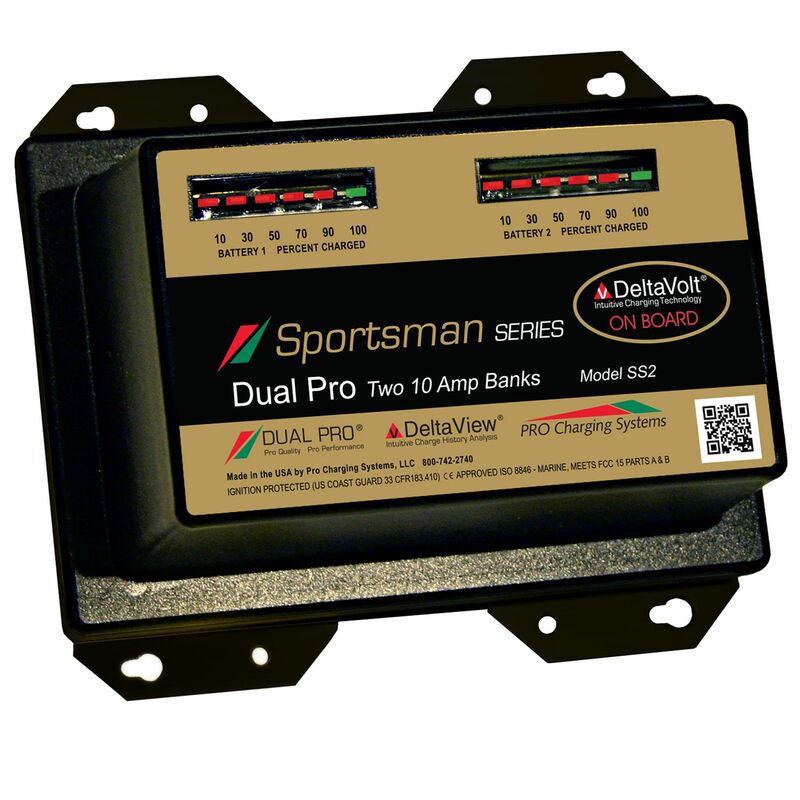 The Dual Pro SS2 can be used for two 12v banks, or one 24v battery bank. Typical installation is for 12-volt series system using one 12v batteries for a trolling motor and an additional bank for a starting 12v battery. Another popular installation is for a 24-volt series system using two 12v batteries for a trolling motor battery, or to maintain two 12v starting batteries. *Will not work on single 24 volt battery such as aircraft design batteries. DC charge cables = 5' AC power cord = 3'. BFG12V The BFG12V battery fuel gauge solves one of the most common complaints about battery status indicators currently on the market today. It features a 12 LED array that indicates the depletion level of the battery pack. BFG24V The BFG24V battery fuel gauge solves one of the most common complaints about battery status indicators currently on the market today. It features a 12 LED array that indicates the depletion level of the battery pack. Do you own the SS2? Please, tell us what you think about it. It helps us provide you with better products. Please note that it may take up to 72 hours for your review to appear.